Bruce Beck is the Assistant Professor of New Testament at Holy Cross Greek Orthodox School of Theology and Director of the Religious Studies program at Hellenic College. He has also served since 2003 as the Director of the Pappas Patristic Institute. 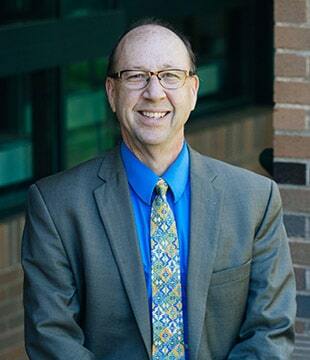 Dr. Beck received both his MDiv and ThD at Harvard Divinity School, where his area of specialization was New Testament and Early Christianity, and the history of the interpretation of Scripture. Before coming to Hellenic College Holy Cross, Dr. Beck held management positions in financial services and computer software companies, which experience he brings to his role as Director of the Pappas Patristic Institute, and as a full-time member of the faculty of the School of Theology. Dr. Beck’s teaching in the area of New Testament bridges the academic study of the Bible with the practical arts of interpreting it in useful ways for the life of the Church today. As an example of his integrated pedagogy, he teaches a yearlong course that follows the Sunday Lectionary readings, providing the opportunity for students to practice the rhythm of weekly preparation of sermons and lessons based on exegetical skills taught in his courses. Dr. Beck’s written work has highlighted the ways in which liturgical hymnology and patristic homilies can be potent sources for the history of interpretation of the Scripture. In addition to academic methods and resources, Dr. Beck privileges the patristic interpretations of scripture (including hymns and icons), to develop for his students a robust Orthodox hermeneutic for preaching and teaching. He also enjoys a fruitful collaboration with the Greek Orthodox Archdiocese Department of Youth and Young Adult Ministries as it develops an Internet resource for young adults to prepare for the Sunday Gospel lesson each week.